← Who Needs Trash Knight? You do! What configuration is right for me- fixed, rolling, or towable? Q. What configuration is right for me- fixed, rolling, or towable? A. Fixed 32 gallon units are for small residential properties which don’t require can movement, i.e., the trash man picks up the garbage from the location where it is stored in the yard. They are also used in any situation, commercial or residential, where mobility is undesirable. In areas without bears, they can be bolted to nearly any flat surface or post mounted. All single can units are designed to be fixed. Rolling units sit on high quality casters, with fixed wheels on one end and swivel wheels on the other. They have stainless steel brakes on the swivel side with a plastic actuation paddle for safe, easy use. They are perfect in residential use to keep next to the garage for daily use. Simply unlock the brakes and roll your unit to the curb on ‘trash night’. Used in commercial roles, they can be placed around a facility as needed and redistributed easily for events that require multiple garbage/recycling storage assets closer to a common area. An example would be a wedding or banquet at a country club. Given smooth pathways, this configuration can also be the basis for a landscaping cart with optional yard tool holders. Towable units are the big work saver. Residentially, they are designed for customers who have long and/or rough driveways. 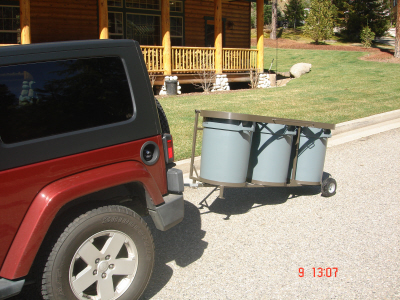 Simply pull the retractable hidden towing tongue out from under the unit and drop it on the hitch ball of your car, truck, SUV, garden tractor, ATV, etc., and tow the Trash Knight out to the curb without having to lift heavy/smelly cans into the back of a truck or SUV. They also provide a much easier way to distribute animal feed supplements in a large stable or equestrian center environment via ATV. 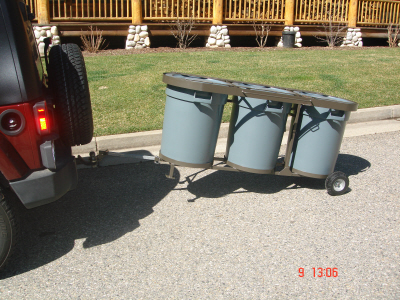 Commercially, towable units efficiently move trash, recycling, and groundskeeping products and tools. For large properties, golf courses, etc., this configuration can also be built with optional yard/garden tool holders. Our flat-proof tires will never let you down.